The essential message is that life and all other things are impermanent. And therefore it’s not about letting go, it’s really about not grasping or getting attached in the first place. However if we contemplate a bit deeper we can see certain steps implicit in this compact instruction set for life. We need to live staying aware of the ever-changing nature of reality and appreciate the present moment. If impermanence is the nature of life and all things then the present becomes all important. If the present is all important, living and acting to the fullest of one’s capacities in the present becomes all important. As we live and act to the fullest of our capacities in the present, being positive in one’s attitude and approach becomes a natural corollary. Being positive and optimistic and being empathetic and compassionate are integrally connected attitudes and orientations as without being empathetic and compassionate to oneself and others one cannot be fully positive and optimistic and vice versa. The spirit of optimism and an orientation for innovation are complementary to each other and together they put one always at the forefront of cutting edge advancements as one can see in the case of Satya in the course of his 25 years’ journey at Microsoft. 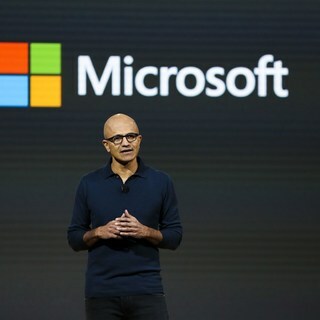 As Bill Gates puts it in his foreword to ‘Hit Refresh’, from working on Microsoft’s server software to moving over to run the company’s efforts to build a world-class search engine; from transitioning away from a purely windows-centric approach to adopting a bold new mission for the company, making big bets on a few key technologies like artificial intelligence and cloud computing, Satya has been part of constant conversation reaching out to customers, top researchers and executives. *Digital tracking tools and genetic sequencing are about to eradicate polio which is going to be just the second human disease ever wiped out. *In Kenya, Tanzania, and other countries, digital money is letting low-income users save, borrow and transfer funds like never before. *In classrooms across the United States, personalized-learning software allows students to move at their own pace and zero in on the skills they most need to improve. This article emphasizes that optimism is the right stance we should all take and attempts to bring out how we can all become active and enthusiastic partners in this rapid progress of our world and society if we knew how to set optimism into force as a creative source and strategy for innovation. This is not only important but urgent and indispensable to do as it truly helps us bridge up the gap between our passion to work on our choicest goals and our vision of the destination that we set out to reach. “Hit Refresh”, as Bill Gates puts it, “is a thoughtful guide to an exciting, challenging future.” There are many lessons which are explicit enough to learn as we go through the book but there are certain implicit ones that are far more significant to work out in greater details for other people and organizations to benefit from especially in regard to optimism and innovation. This article aims to bring out how Optimism can be set into force as a Creative Source and Strategy for Innovation keeping a focus on the Alchemy of Organizational Transformation Underway at Microsoft as described by Satya in ‘Hit Refresh’. The basic proposition of the article is that passion is not complete until one is able to channelize its force into one’s whole being. Compassion helps us break all the barriers within and optimism helps us build up novel pathways for its flow towards the vision and the achievement of one’s goals. Despite being passionate for one’s vision and goals, frustration of life energies is possible in the course of one’s journey towards long term vision and goals and this naturally results in the onset of negative and depressive tendencies. What comes to one’s help in such a state of affairs is the force of compassion. If we look at it deep enough, compassion is in fact a profoundly positive outlook on life, people, circumstances including oneself in their totality and complexity surpassing all egoic barriers. In fact, it’s the triune force of passion, compassion and optimism which is the forceful combination that leads us on the sure course to accomplishment of a long term vision and goal. It is this efficacious combination that constantly engages one in a continually positive and innovative outlook and results in real, meaningful innovations. If we look at it in consciousness perspective, a true orientation for optimism involves passion, purpose and positive orientation. Passion for doing something challenging provides the necessary thrust which sets optimism into force, purpose provides sense of direction and a positive orientation is the very heart and soul of optimism. Optimism involves passion because without the energy passion brings to it optimism is impotent. There are people who feel positive about something challenging attainable but without the energy of passion that positive orientation is of little force and therefore of no value. Passion adds energy to a positive inclination and turns it into real optimism. Sense of purpose sets the force of optimism flow into desired direction. But for optimism to become thorough and a real promising proposition compassion and innovation are indispensable. Lack of compassion for oneself and others cuts at the very roots of optimism and without an innovative outlook and approach optimism is not forward looking and therefore no true optimism. Thus passion, purpose, positive orientation, a compassionate attitude and an innovative outlook and approach are the very heart and soul which bring optimism alive and set it into force. With optimism thus set into consummate force not only great innovations become possible, organizational transformation also becomes a reality and a concomitant process and phenomenon. If we look at the Microsoft story unfolding under the leadership of Satya Nadella in this perspective it becomes more meaningful and applicable across organizations. The sense of purpose that inspired its founders Bill and Paul was “democratizing leading-edge computer technology”. It’s worthwhile studying how the force of compassion melts the hard inner psychological barriers and the force of optimism forges new harmony among them. * Suspending judgment and staying in the moment. * Sharing personal passions and philosophies. * Reflecting on who they are both in home life and at work. * Connecting their work persona with their life persona. If we look at the dynamics of consciousness at work here, suspending judgment implies suspending the judgmental mode and frame of mind in which we are usually caught. Our likes and dislikes, resentments and contentments are the shades of this mode of mind in which our life energies remain hooked. Staying in the moment helps us unhook ourselves from this narrow frame. Sharing personal passions and philosophies as Satya’s team does helps break the self-built barriers between fellow team members. Reflecting on who they are both in home life and at work helps them connect themselves more totally within. Thus a total sense of connectedness, inwardly and outwardly, a sense of wholeness helps them feel total and whole. It is this sense of totality and wholeness resulting in a holistic outlook which lies at the heart of compassion. Thus compassion has the power to set optimism into force to build up novel pathways for the flow of passion and the tremendous energy involved in it towards the long term vision and goals. “So many people around the world today depend on mobile and cloud technologies without knowing it. Hospitals, schools, businesses, and researchers rely on what is referred to as the ‘public cloud’—an array of large scale privacy-protected computers and data services accessible over a public network. “Both in the state where I was born and the state in which I now live, schools use the power of cloud computing to analyze large amounts of data to uncover insights that can improve dropout rates. In Andhra Pradesh in India, and in Tacoma, Washington, too many kids drop out of school. The problem is lack of resources, not lack of ambition. “Thanks to mobile and cloud technologies, a startup in Kenya has built a solar grid that people living on less than two dollars a day can lease to have safe, low-cost lighting and efficient cookstoves, replacing polluting and dangerous kerosene power. It’s an ingenious plan because the startup can effectively create a credit rating, a byproduct of the service, which, for the first time, gives these Kenyans access to capital. “A university in Greece, leveraging cloud data, is working with firefighters in that country to predict and prevent massive wildfires like the one in 2007 that killed eighty-four people and burned 670,000 acres. “In Sweden, researchers are using cloud technologies to ensure that children are screened earlier and more accurately for dyslexia, a reading disorder that impacts educational outcomes for millions. Eye movement data analyzed at schools today can be compared with a data set from those diagnosed with dyslexia thirty years ago. Minimal changes in life incremental in nature are not that difficult to bring about but when it comes to changing planes or shifting paradigms one needs profound passion, thorough optimism and consummate compassion. It is such changes, transformative in nature that Satya is referring to. It’s essentially a shift of vision in computing technologies from PC first and Phone first to mobile first and cloud first, a change that amounts to a paradigm shift that lies at the base of these transformative changes. The power to connect the inner potential with external possibilities comes from optimism. Passion imparts us the impetus, compassion clears the hurdles and optimism sets open the pathways to traverse the course from vision to its material realization. Passion not only provides the necessary force but also a sense of purpose which brings with it a sense of direction. Compassion helps demolish the egoic barriers which are quite naturally associated with passion as rose bushes do with the beautiful flowers. It’s the nature of passion to have its own way often at the expense of its owner as fire in disproportionate measures and intensities may consume the substance it’s been set to melt or refine. Compassion helps demolish the barriers not only psychological but also material as it helps passion reach its inherent vision and culminate into the innovation its insights compel it to achieve and attain. Satya gets to the core of the essence and power of empathy and compassion and goes on to weave them into the very approach of his leadership in all its aspects. * work to change the world. * build digital platforms on which individuals and organizations can build their dreams and businesses. * enhance and enrich human life and living experience with artificial intelligence aids. * enhance and enrich human experience discovering novel dimensions with mixed reality. * find more ways to enrich human life and experience with emerging AI technologies and mixed reality. When optimism is thus set into consummate force with the power of compassion at its core, it leads to great innovations. My passion lies in Consciousness Studies which I've been exploring for more than thirty years now. I'm a former University teacher with 20 years' experience in teaching and research.